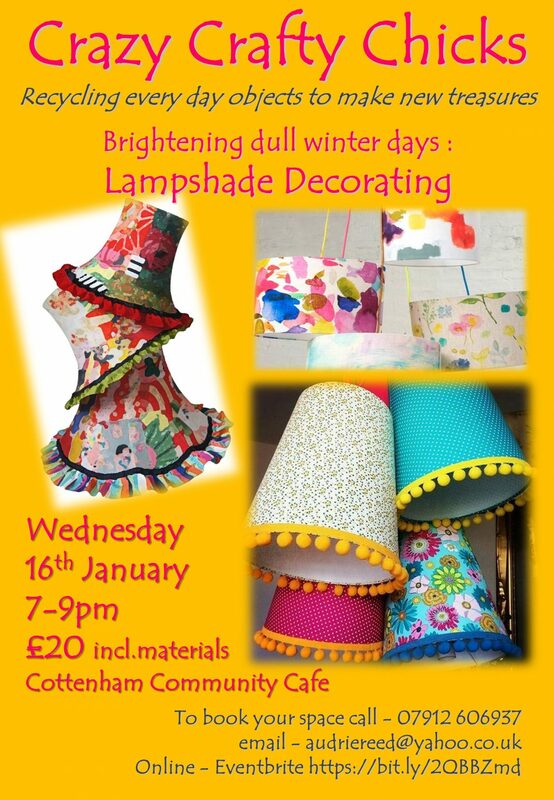 Decorating lampshades to brighten your home – Crazy Crafty Chicks at Cottenham Community Centre on Wednesday 16 January at 7pm. We will be decorating lampshades – they can be used on an existing fitting, but I’ll also be bringing a selection of glass and other containers which you may wish to use for your base. There’s a lovely assortment of lightshades – round ones, cylindrical, cones, large and small. There’ll be wallpapers, scrap-booking papers, fabrics, lace, pompoms, ribbons, feathers and lots of other exciting bits to decorate your shades. They can look extra gorgeous with a string of fairy lights inside the base and/or around the shade – giving that perfect warm winter glow. Please note fairy lights are not supplied with this workshop, feel free to bring your own – you can get them from B & M, Pound shops, etc.